October 29th is Take Me Outside Day 2014, and at Little Tulips Family Child Care, we are committed to spending at least one hour outside! Take Me Outside Day, in partnership with The David Suzuki Foundation and The Child and Nature Alliance of Canada, is an opportunity for schools across Canada and around the world to show the importance of getting outside. It’s a day to support education extending beyond four walls and a desk! 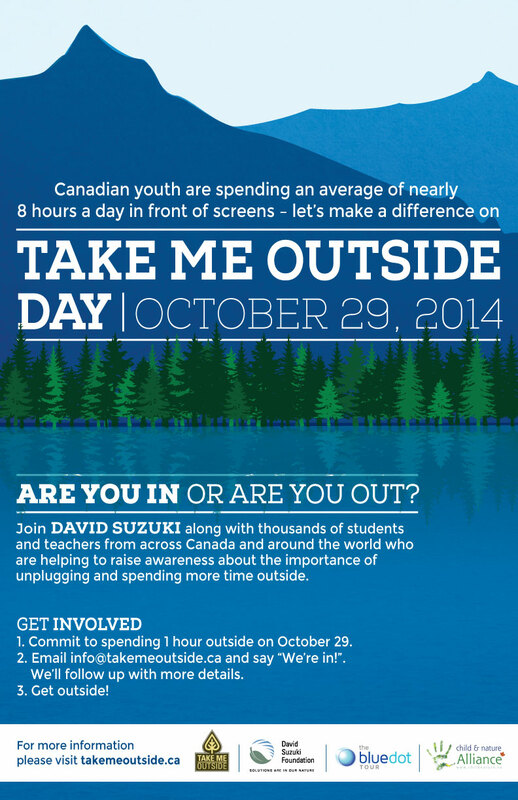 Last year, Take Me Outside Day had approximately 500 schools participate. This year, David Suzuki will be supporting this initiative and joining along with hundreds of schools across the country and around the world to help raise awareness about the importance of spending more time outside. Research shows that outdoor play in a natural setting makes kids healthier and happier, and we love healthy, happy kids! Children are naturally drawn to active play outdoors. It allows them to explore their environment, develop strength and coordination, and gain self-confidence. The outdoors is the very best place for preschoolers to practice and master physical development skills like running, jumping and climbing. Outdoor play also contributes to social / emotional development, when children are free to express themselves and learn about the world in their own way. Aside from the physical, social, and health benefits that we know to be true, playing outside is FUN! So, get out there!